Raised by Wolves will not receive a third season. A Kickstarter campaign started by Caitlin Moran failed to raise the money needed to produce more episodes of the comedy series. The goal that needed to be reached was 320,000 pounds. The Kickstarter campaign managed to raise slightly over 200,000 pounds from more than 3,000 backers. Caitlin and Caroline Moran had the idea to bring back the series after the fans reacted strongly to the cancellation of the series. “Well, it’s over – the show we all love, and is celebrated here with a banging Best Of, tried its best, but didn’t quite make it. After a month-long campaign – the length of time a chipmunk is pregnant, interestingly – our noble, glorious Kickstarter is at an end, and, sadly, we didn’t quite reach our target. We needed £320,000 to continue with Raised By Wolves, and, as the Kickstarter ended last night, we’d got £200,207 – a sum we can’t preface with the word “only”, as it’s a huge sum of money, donated by 3869 of you, in a world where hard-earned cash is difficult to come by. We’re incredibly moved by all the love, belief and cash directed towards our favourite family, and we want to thank each and every one of you that donated, or Tweeted, or spread the message. For thirty days, we were united by something – not bad in a time of dolorous news and increasingly vexing weather. Obviously, all those of you who pledged will now get to keep your money, so that’s a nice Christmas bonus. Get yourselves a good quality ham, or cheeseboard. It’s what the Garrys would have wanted. We love you all. Thank you. Would you have watched a third season of Raised by Wolves? Are you sad that the Kickstarter campaign failed? Tell us what you think. More about: Raised By Wolves (UK), Raised By Wolves (UK): canceled or renewed? 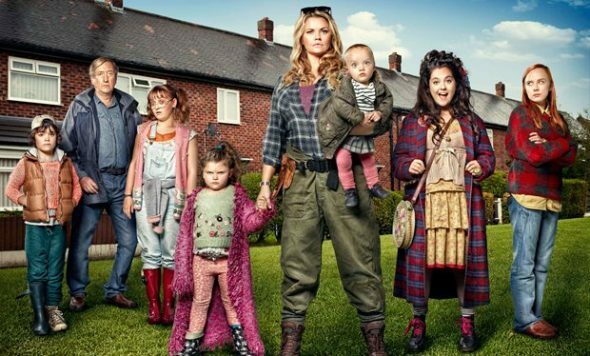 Raised By Wolves: Cancelled by UK Channel 4; No Season Three, or Is There? Have you tried indiegogo? I imagine now it is on in the US you might get more money… We love it … It makes us laugh out loud …. And that’s with missing a lot of the words! Don’t give up … Yeah u have a real gem! Gutted that it’s over, I watched series two this time last year. A brilliant, quirky female led programme that has forever perverted my brain. It’ll be sadly missed.